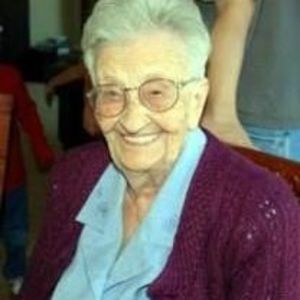 Patie McCallister, 105, of Huntington, died Saturday, January 28, 2017 in St. Mary’s Medical Center. She was born October 14, 1911 in Rose Creek, TN, a daughter of the late Bruce and and Mittie Blakley Leonard. In addition to her parents, she is preceded in death by her husband, Carston McCallister; sisters, Lyda Myatt and Artie Leonard, brother, JR Leonard and a half brother, WT Leonard. Patie had no biological children but was devoted to her great-niece Michelle Hall and played a significant role in her upbringing. She is survived by her nieces, Michelle Hall (Chris) of Huntington, Charlene Fields and Julie Fields of Charleston, Gwen Rakestraw (Bill) of Mississippi, nephews, Chuck Donald and Alan Donald (Kathy) of Mississippi and Huckey (Peggy) McCallister of Charleston, WV; five half sisters: Liz King, Shirley Mullins, Brenda Horton, Betty Ward, Debbie Stanfill, and a half brother, RB Leonard all of Tennessee. Patie had many great nieces and nephews who she loved. Lucas, Amelia and Garrett Hall loved her dearly and brought her along to many baseball games, recitals, birthday parties, church and many family get togethers. A celebration of life will be held 6 p.m. Thursday, February 2, 2017 by the Rev. Skip Seibel in the chapel of the First Presbyterian Church of Huntington. Interment will be held privately in Tyler Mountain Memory Gardens at Cross Lanes, WV. Klingel-Carpenter Mortuary is in charge of arrangements.